The origins of microblading are largely unknown, but similar techniques of making tiny incisions into the skin and inserting dye are certainly thousands of years old. It entered mass popularity in Asia about 20 to 25 years ago, and was called (among several other terms) brow feathering or brow embroidery, to emphasize the more natural looking results it produced. It began to catch on elsewhere, first in Europe and then in the United States, in the 2010s. By 2015, microblading reached the status of being considered the most preferred method of eyebrow cosmetic procedures available. 1. Microblading artists hand draw each line. Eyebrow tattooing uses a machine. This makes a big difference. Microblading features very fine lines and when applied by a skilled artist, those lines do not “bleed out” over time. This is not true of traditional eyebrow tattooing. Eyebrow tattooing is usually done by a machine, with much greater injury to the skin. The lines that are created are not as fine and, over time, begin to bleed out. If you’ve ever seen someone with tattoo handwriting on their skin where the writing get thicker over the years, then you know the effect. 2. Microblading has different retention time from tattooing. The fine lines of microblading are semi-permanent and will fade over time, usually over 1 to 3 years because there is a lot less ink deposited under the skin in fine lines. In the dermis, where the ink is placed, this ink can move around over time, giving a slighter appearance. The rate of fading and disappearance depends on the skin type and how much ink was inserted. Despite the semi-permanent nature, microblading is much better for the skin and, most importantly, ensures a completely natural appearance of the eyebrows. When there is a lot of ink, like in traditional tattooing, the tattoo remains somewhat consistent. While it is permanent, there are problems with the appearance of the tattoo over time that are discussed on this page. 3. Inks maintain their color with microblading. Microblading uses a different kind of ink that maintains its original hue over time. Many tattooing clients report that their tattoos turn blue or brown over time. With microblading, however, colors tend to get lighter, rather than changing hue. Again, this is a more natural appearance. 4. Microblading is less painful. Microblading artists use a topical anesthetic, which numbs the skin. In fact, many clients report feeling little or no pain. Some people fear traditional tattoos on certain parts of their body because of the pain, but this is typically not an inhibiting factor for microblading clients. 5. Results from microblading are more natural than traditional eyebrow tattoos. Each individual eyebrow hair is drawn in, by hand, in microblading. To the naked eye, these individual hair strokes blend right in with a client’s real hair. 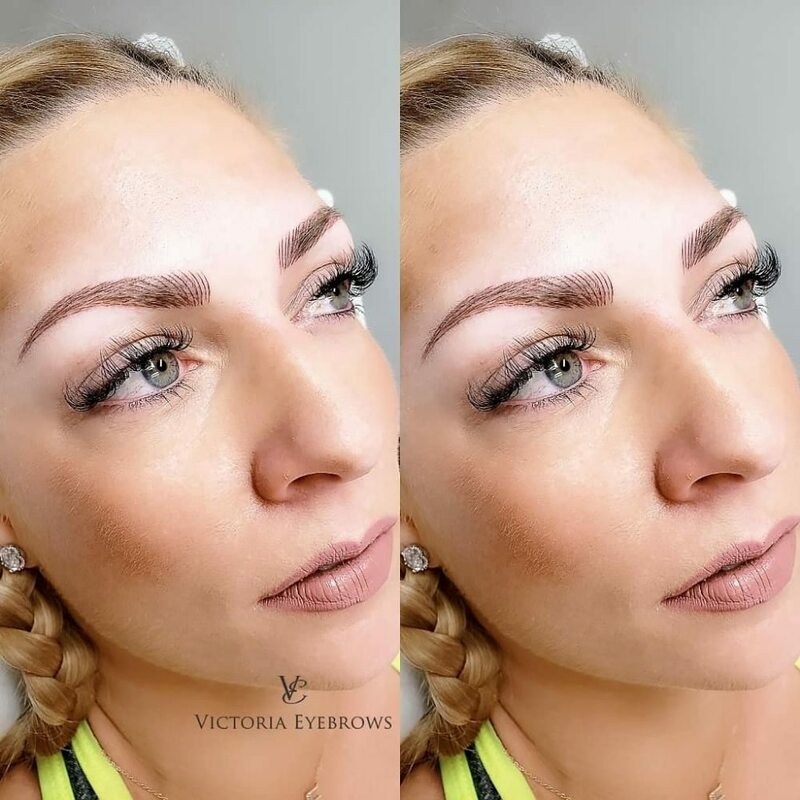 While eyebrow tattoos may look more like traditional permanent makeup, microblading looks more like natural eyebrow hair. 6. Microblading artists are not necessarily tattoo artists and vice versa!